A man has died following a crash involving a motorcycle and two cars in Bretton Way in Peterborough last night. We are now able to confirm that a 42-year-old man was pronounced dead at the scene of the crash last night, Wednesday August 22, and next of kin have been informed. Two men and a woman have now been arrested following the incident. The crash took place at about 5.20pm at the junction of Deerleap and Bretton Way and involved a motorcycle a Peugeot and a Saab. The 42-year-old father and grandfather was riding the motorcycle at the time of the crash and reiceved fatal injuries. One of the cars, the Saab, left the scene but was found nearby. 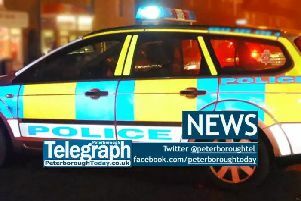 Speaking to the Peterborough Telegraph from the scene, Sgt Simon Goldsmith said: "Any witnesses to any vehicles which arose suspicion in the Bretton area this afternoon, but specifically between 5pm and 5.30pm, are asked to contact road policing on 101." The road was closed between between the Bretton Way BP Garage and Tyesdale Roundabout and remained closed for around seven hours while police worked. Anyone with information should contact the police's road policing unit on 101.